While some boys are into traditional competitive sports like soccer and hockey, others like to get a little extreme. For those who are into more intense sports, motocross blankets and dirtbike bedding are the perfect decoration for a bedroom. Enjoy a photograph of a biker catching some serious air, use the abstract designs to incorporate a certain color, or just enjoy the aesthetics of a cool-looking bike with these fun bedroom decorations. One thing many people associate with the sport is taking on dirt jumps to catch some air. When flying midair past the sunset, this makes for a pretty cool silhouette. 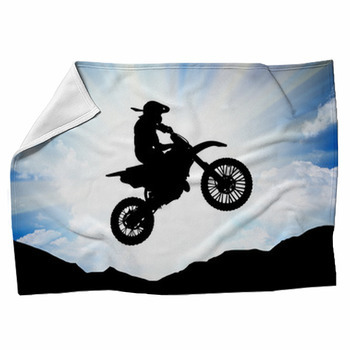 One design available for motocross blankets depicts the silhouette of a biker midair on his dirt bike. The background is manipulated to look like green light, which makes for a cool and colorful design around which to base the room. Some might be into a more traditional or versatile look for a motocross-themed bedroom. However, this does not mean you have to compensate any sense of the extreme. 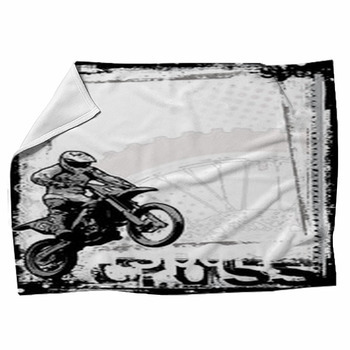 Motocross bedding is available with simply a black image of a biker performing an intense trick on a white background. This is perfect for an intense design which is not too loud or demanding of attention, so the rest of the room's decor can have some attention, too. Others might be most interested in the concept of motocross racing. 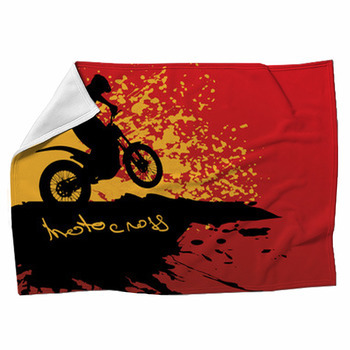 There are motocross blankets which show off a photograph of a few racers on their bikes speeding through the dirt for the finish line, representing their racing numbers and signature uniform colors. The realistic picture is a fun addition to any room, and imagining you are right there in the race really brings the sense of the extreme to the rest of the design scheme. Motocross is a sport that can get really, really extreme -- and that is why a lot of people watch it! 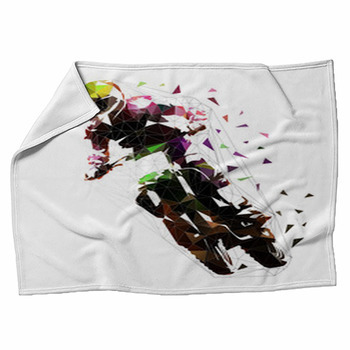 If you want to show off the craziest motocross moments, try throw blankets printed with riders doing their craziest stunts. One design, for example, shows off a biker guy and his vehicle in midair. Instead of in the traditional sitting position, he is standing vertically with his feet tucked under the handlebars. Now that is intense! 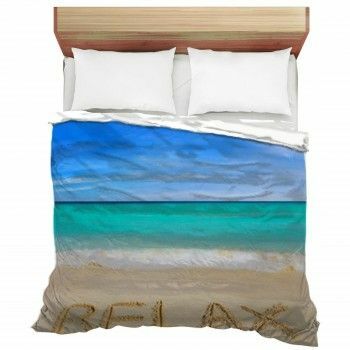 These also make great personalized blankets, especially on the more abstract and less visually complex images. One focuses primarily on the black silhouette of a biker on his motorcycle, midair, hanging off the back in a superman-like stunt. The background, however, has been altered to simply portray pink stripes. This makes a great base for personalizing the rest of the decoration by adding your own words to make for a memorable keepsake. There are few things more fun and exciting to watch than extreme sports, which is why they make a great theme for any boy's bedroom. 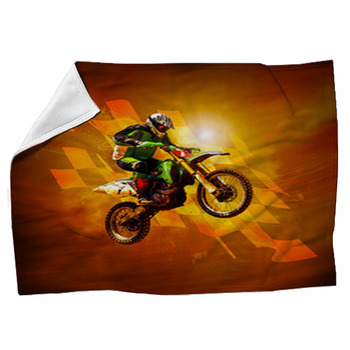 Motocross blankets are a great addition to provide something interesting to the room. 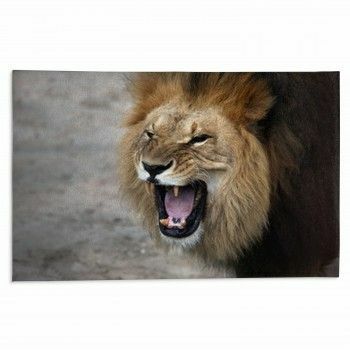 Whether you choose to show off bikers performing their most extreme stunts or simply an intense-looking race, boys who love extreme sports will have to have these additions to their decor.